Heidi from Snappy Tots is putting together a CAL Advent Calendar and asked if I would be interested in designing something for it. 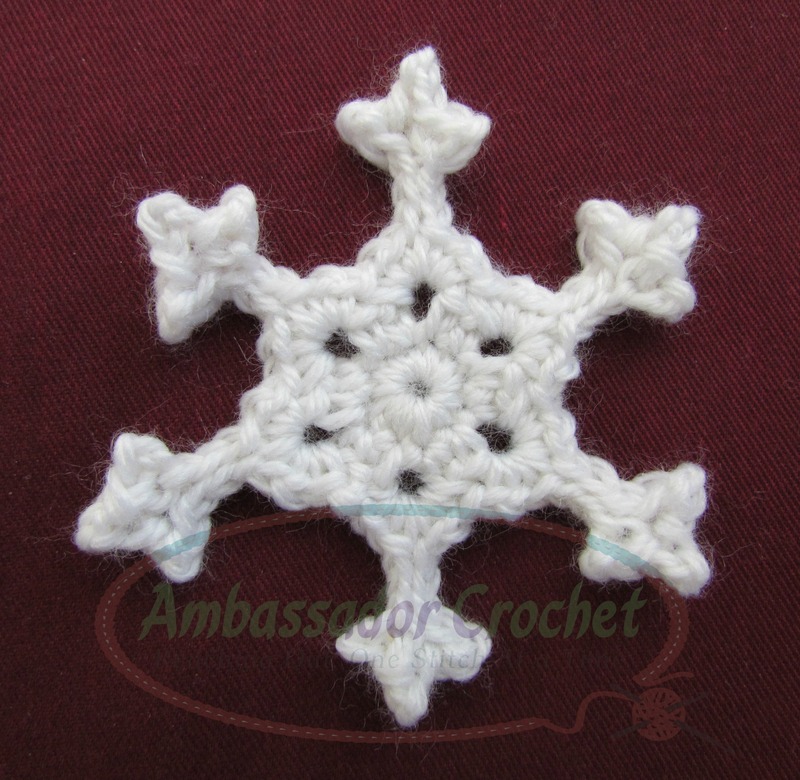 Here is the snowflake pattern I made. If you’re interested in joining the CAL visit Snappy Tots blog here. Round 3: (sc, ch1, sc, picot stem, sc, ch1, sc) in each ch3 space around, sl st to 1st sc. Fasten off. Buen día, me gusta mucho su blog, pero tengo problemas con la traducción. Por favor podrían poner un “traductor”. So very beautiful! Of all of the many, many snowflake patterns I’ve gathered, this is the one I’ve been waiting for, and will be the first one I’ll make. You’ve made my day. Thank you so much for sharing! It’s a beautiful snowflake. Thank you so much for sharing the pattern. I’m picturing hanging some of these in all my windows. This is beautiful! I have been looking to add a couple flowers to a scarf I crocheted for my niece for Christmas, and didn’t know what to do for my nephew. Now i know! He’ll get snowflakes! So cute! I intended to crochet all our ornaments for the tree this year but I haven’t done a single one! This is so cute! i’m going to make a pair of earrings ^–^ maybe more than one in different colors! (im not going to sell them though if you are wondering) just gifts for some family!! Thanks, Kayla. Just so you know, you’re free to sell anything you make from my patterns. It’s always appreciated if you say where you got the pattern, but not manditory. I was looking for some last minute ideas for Christmas napkin rings. I think that I have found what I was looking for. Many thanks for sharing this lovely pattern.